Another very cool part of this week’s Scream Awards on Spike TV was a deleted scene from J.J. Abrams‘ new vision of Star Trek that will appear on the movie’s DVD special features. The scene brings the well-known Trek species known as Klingons into the mix. 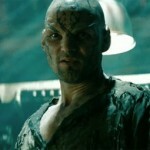 In the movie, the Klingons were not used and the villainous race were the Romulans and Captain Nero (Eric Bana). The deleted scene shows Nero restrained on a table while a helmed Klingon questions him and threatens to extract the information that he wants by means of a nasty little bug called a Centurion Slug that doesn’t enjoy dark, restricted areas, and will force its way out if need be. (And now we know where Nero got the idea of using said Slug for his interrogations.) Nero then finds the opportune moment and fights off his captors in an attempt to escape. Click over to check out the deleted scene from Star Trek, which will be released on DVD , Blu-ray , and digital download on November 17, 2009. The scene ties together some loose ends from the movie in which viewers wondered where the hell Nero had disappeared off to for many years. Seeing the deleted scene now, you may even become more confused as to why Abrams even cut the scene out of the final product. It would not have altered anything; it wouldn’t have made it too long; and all-in-all, its deletion just doesn’t make much sense. The only reason I can personally think of is that maybe the director didn’t want the popular Klingons to take away from the status and concentration on the Romulans, who had to be the enemy in focus.